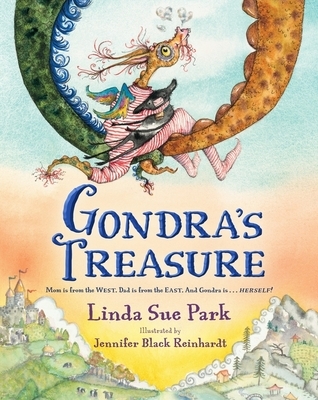 Gondra, a little dragon with an Eastern dragon dad and a Western dragon mom, celebrates her uniqueness in this sparkling collaboration between Newbery medalist Linda Sue Park and rising star artist Jennifer Black Reinhardt. Gondra has inherited traits from both her eastern (Asian) dragon dad and western (European) dragon mom and enjoys them all. She's especially happy that she's a combination of both. Cheerful banter and hilariously adorable dragon portrayals present a warm, appealing family portrait. The beautiful and fanciful illustrations are rich in whimsical details that invite repeated readings.